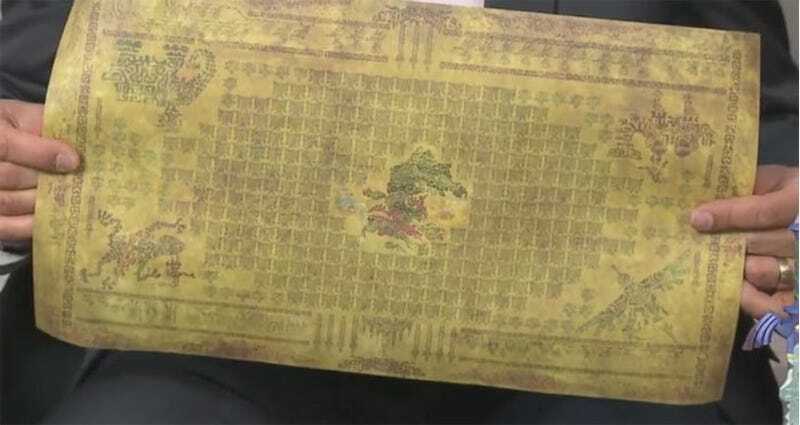 Fans have uncovered some information of The Legend of Zelda: Breath of the Wild’s backstory thanks to some sleuth-work involving a map included in the game’s special edition. Breath of the Wild’s special edition was shown during the recent Nintendo Switch Treehouse stream. It includes a music CD, Master Sword statue, special Switch carrying case and more. One of the most interesting items is a map. On the back, a tapestry outlines the game’s history. As heard through Eurogamer, fans have taken still screenshots of the map and translated it to learn more about the game. The fictional language used on the map was deciphered when the first trailers for the game were released in June 2016. It explains a lot. One of the big questions I had when I first saw Breath of the Wild was where the various mechanical enemies came from. It turns out that they were released as part of the effort to stop Ganon. The entire backstory paints a tragic picture. Ganon gets his Ganon on an destroys nearly everything until he’s driven back by the mechanical army and some divine beasts. This lets the Sheikah seal him away. It’s not entirely clear what happened to the Hero during all of this but it seems that he was also sealed away just in case Ganon ever broke free. Which is smart because Ganon always breaks free. Link awakens in chamber full of Sheikah tech at the start of the game and the latest trailer makes a pretty big deal out of the events that happened “100 years ago.” Thanks to these translations, we definitely have a better idea of what happened than Link does.